How long have piers existed? Piers can trace their roots all the way back to 1720 in England, where they were invented. In the nineteenth century, lighthouses were supported by Helical Piers as well. Why is the term helical used? Helical anchors are essentially small shaft pipe piles with one or more helical bearing plates attached. Instead of being hydraulically vibrated into the ground, like a pipe pile, they are gently rotated into the ground using high torque hydraulic drive head. They can support most structures, including industrial, commercial, or residential. Screw piles, helical piers, and helical piles are synonyms for the same type of foundation solution. They were coined screw pile because of the way they turn and bore into the earth. What is the difference between a square shaft and a round shaft? PierTech recommends using square shafts in tension situations because it has a greater yield, tensile strength, and higher torque capacity. Round shaft should be used in compression situations because it has a far superior lateral stability (the strength to resist twisting and deflection), as well as it has greater load capacities. What are the most popular applications for helical piles? Helical Piles can be used on most structures in new construction or repair, and in 80-90% of soil conditions that exist. However, they are typically used in complex soil conditions or limited access situations that have prohibited the use of other traditional foundation systems. What are some of the advantages of using piers over other foundation types? Piers are superior to other methods in many ways. Hand-dug and drilled concrete piers can do an adequate job. However, they are extremely time-consuming, messy, expensive, and labor intensive. Driven Piles can be effective, but limited access and sensitivity of existing buildings make their use difficult for an installer. Helical piering is cost-effective, requires little to no concrete, can be performed in limited access situations, and is virtually vibration free. What is their life expectancy? Many factors determine the life expectancy. Though Helical Piers can be galvanized to prevent rusting, the varying soil conditions can affect the life expectancy. It is the general estimation that piers last over 150 years in normal soil conditions. How much weight can a Helical pile support? Depending on the job our Hercules Pile can hold more than 500 tons or 1,000,000 pounds. You would see similar loads on a 10 story building application. Will the interior of my house be damaged after installation? Most of the time the house will not be damaged by the installation. In fact, you may find doors starting to work correctly and some cracks may close. 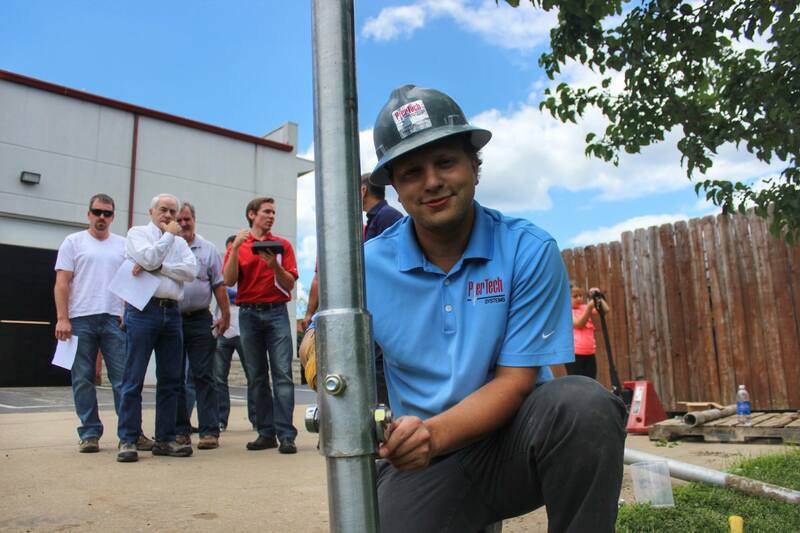 Why do you put helical piers under an existing foundation? Helical Piers are used to underpin homes that are sinking, saving the home from additional structural damage. When used in combination with our Tru-lift system, homes can be secured to prevent further settling or raised up to the proper height. Can helical piles be installed in tight spaces? Yes, our products can be installed in tight spaces. Our portable equipment allows us to install when there are clearance issues, preventing heavier equipment from being used. How deep can helical piers be installed? Most are installed between 10 to 25 feet below the soil but may be required to extend deeper if the required torque is not met. We have had some piles installed as deep as 100 feet. What kind of warranty or guarantee do you offer with your helical piles? We offer a 75-year limited warranty. What is the minimum spacing? A general rule is that they should be spaced 3 to 4 diameters on center. Typical Helical Pile spacing is 5 ft – 10 ft.
How do I know when I have a foundation issue? You may notice cracks in drywall, gaps between walls and ceiling, doors may be sticking, nails coming out of the drywall, windows may stick, cracked floors, or there may be gaps between walls and floors. These all may be an indication of foundation issues. What are the chances of having more foundation issues after an anchor is installed? The chances of this are slim to none if you are using a quality company that provides the proper service to get them installed correctly. What kind of equipment is used for installation? PierTech offers installation equipment that attaches to skid steers, mini and full-size excavators, and backhoes. PierTech even offers handheld installation equipment for limited access areas. How do I become a PierTech Certified Installer? To become an Installer you will need to attend one of our installer certification seminars. PierTech offers this training seminar for FREE and is available to attend once every month. Call us TODAY to reserve your spot at the next one! What are some of the benefits of becoming a PierTech installer? We offer FREE Training that will help the installer learn the best methods for installing piers in their soil conditions. The PierTech training program teaches the science of torque ratio to load capacity and soil mechanics, in a way that is both easy to learn and understand. Superior Customer Service and Engineering Support. When you call PierTech you will always get a “Live Person”. We always follow up and assist even during your most challenging projects. PierTech understands the importance of customer service and building lasting relationships. PierTech does not oversaturate territories, we keep an extensive inventory of material and equipment for expedited delivery. We continue to innovate our products and equipment to make installation easier and more efficient. Patented Products: the Tru-Lift bracket and Cross Bolt connection, made from high-quality American made and manufactured Steel. How do I find a PierTech Installer? You can use our locate an installer option and fill out the form, or you can call us directly at (866) 536-5007. How long has PierTech in Business? PierTech has been manufacturing Helical Piers and Equipment for more than 15 years. What is PierTech’s typical delivery time of products and equipment? Standard inventory items are shipped immediately since we stock specific material for faster delivery. If it is a specialty item, we generally ship in 2-3 weeks. How does PierTech’s Pricing Compare with other manufacturers? Our products and equipment are very cost competitive (Sample prices and quotes are available upon request). PierTech manufactures drive heads from 5,000 foot pounds of torque to 375,000 foot pounds of torque. We size equipment for your machines and projects and offer a full line of torque monitoring equipment, attachments, and tools. What size helical piers does PierTech offer? PierTech manufactures 1 ½” and 1 ¾” Square shaft (Tension), 2 7/8’ and 3 ½” (Compression) for residential and light commercial. We also offer 4 1/2” – 16” OD Hercules Piles for commercial and industrial applications, also for loads more than 500 tons. We offer free training once a month in St. Louis, where we certify contractors to become PierTech Installers. Everything from the basics of installation, design, and marketing will be discussed, along with a live demonstration.